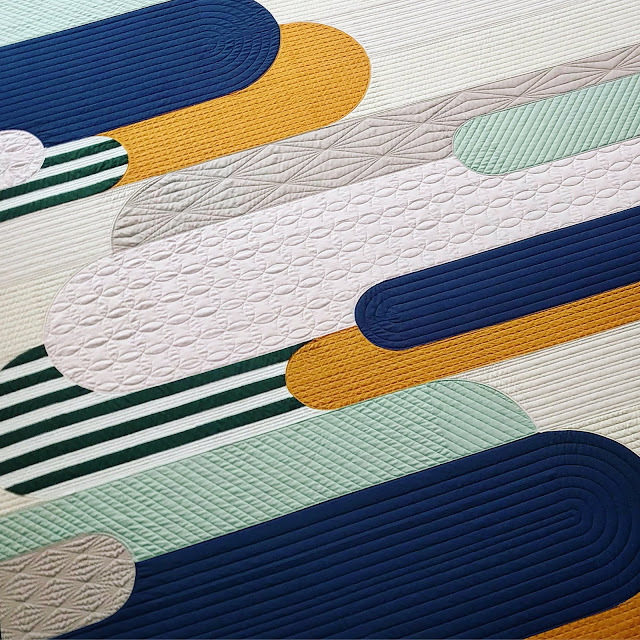 A few months back Curated Quilts announced that their next magazine would have a curve theme. I was so excited and even though I already had three looming deadlines, I submitted my design, Banner Day, and it was accepted for publication as a pattern! 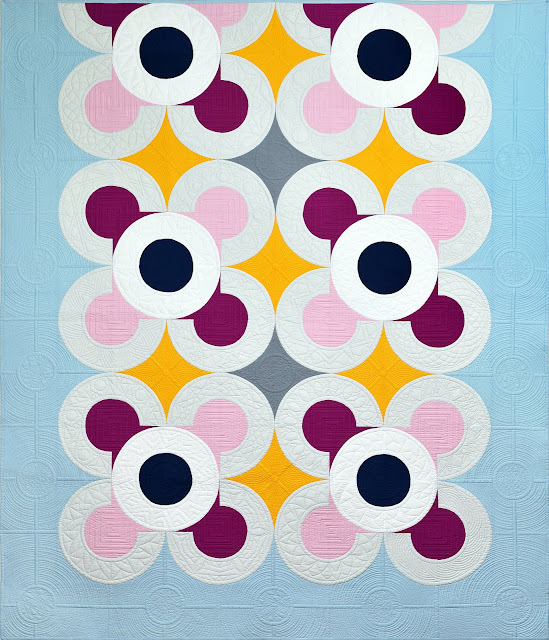 The curve issue of Curated Quilts started shipping earlier this week and is currently for sale on their website. There are so many great articles and quilts in this issue I can't wait to get a copy in my hands! Unfortunately, I forgot to take pictures of Banner Day before I shipped it off but I do have a picture of the quilt as shown in the magazine. As soon as I get the quilt back from the magazine I'll get more pictures up. In the meantime, I can share the original design mock up. 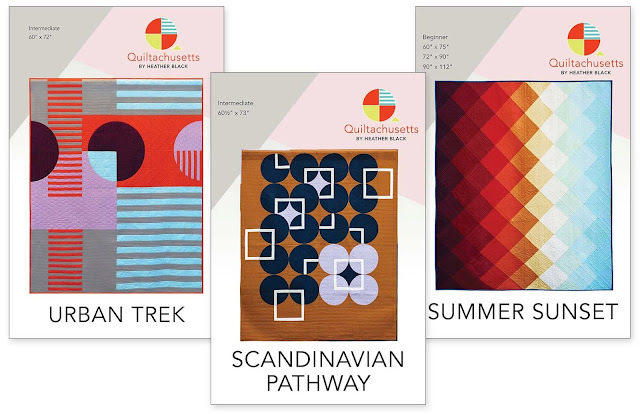 Along with the Banner Day pattern I was asked to share Scandinavian Pathway in gallery section of the magazine. Scandinavian Pathway is currently available as a pattern in my Etsy shop. 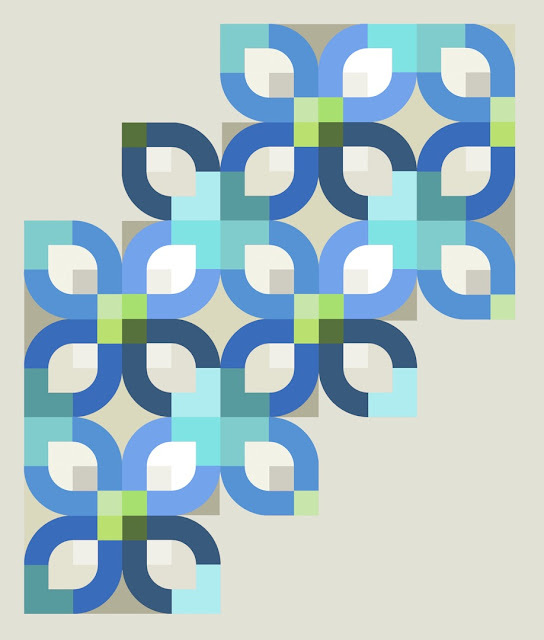 I've been waiting for a super long time and have dropped a hint or two here and there but I finally get to share that last year I was asked to design, piece, bind and write the pattern for the QuiltCon 2019 Giveaway Quilt, Keyhole Kaleidoscope! 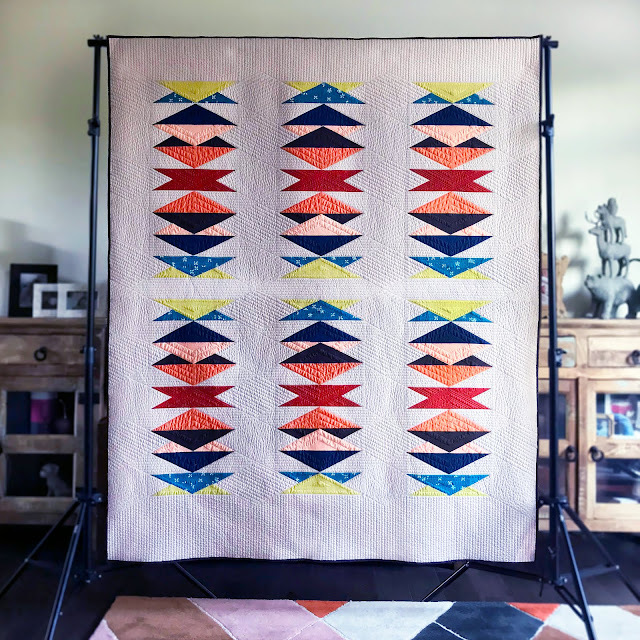 When I got asked to make the QuiltCon Giveaway Quilt I'd only done a few quilts on my longarm and knew that the work for this quilt had to be beyond stellar so I asked my friend, Christine Perrigo (@ccpquilt), to quilt it. The quilt is 70" x 84" and Christine covered every square inch we amazing quilting! 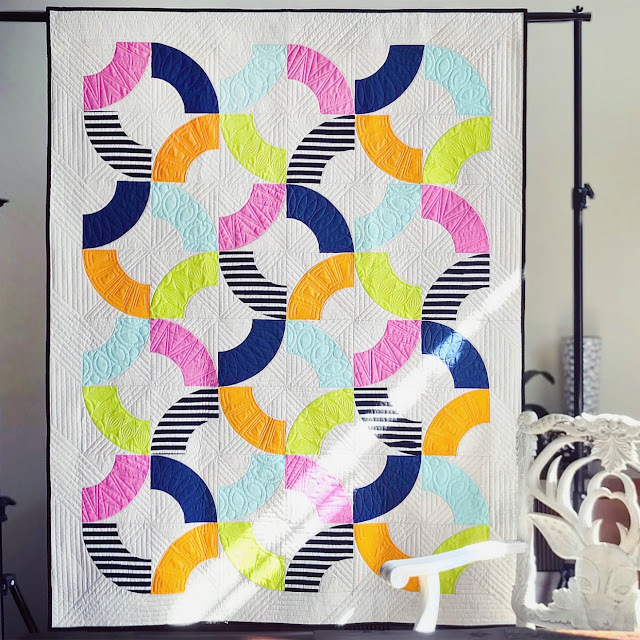 This quilt features Moda Bella Solids with subtle color differences along with high contrast to create depth and movement and is available as a pattern on The Modern Quilt Guild website for $10. Thank you to everyone that has purchased one of my designs at honestfabric.com ! My Trellis quilt is doing well and I wanted to offer a more neutral color way so I designed an off white and blue version. All Honest Fabric designs are available in three sizes: 51" x 60", 68" x 80" & 88" x 104" and quilt up so nicely. The fabric is soft and the printing is amazing! I've also added a new design, Light Bending! This design is inspired by a quilt I made several years back and is now my daughter's favorite quilt. I think Light Bending has great potential for creative quilting and you've gotta love those bright colors! If you haven't already go check out Honest Fabric and all the amazing quilt tops! I have six different designs available and several colorways and am hoping to add a few more this year. I've been keeping this secret since this summer and I finally get to share the fourth quilt heading to QuiltCon 2019, Colonnade!! This quilt, and many other quilts from QuiltCon are available as patterns in the latest issue of QuiltCon Magazine instantly as a digital download or for preorder from The Quilting Company! 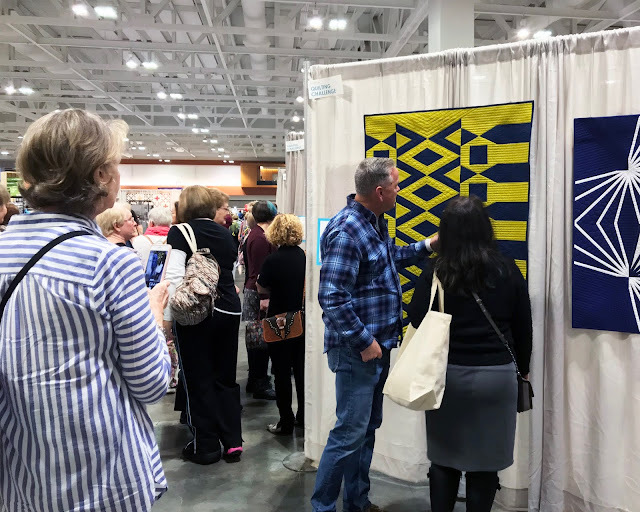 Along with the QuiltCon quilt patterns there are articles about this year's show and a gallery section featuring some amazing quilts that will be at the show. This quilt has plenty of meaning to me for many reasons but one of my inspirations for the quilt was a dream I had where there was a beautiful portico drenched in warm light. It uses equally warm colors and a repetitive pattern to mimic columns.